Threaded Rods offered comes in threading options of 3/8" to 1-1/2" inch for all size in stainless steel and mild steel construction choices. These rods comprise pre-threaded bars that are suitable to be used in different industry sectors like construction, mechanical, plumbing, electrical and others. Featuring clean cut ends for easy and smooth movement of nuts while handling fastening operations, these rods can be made available by us in standard thread sizes as well as in customization options as specified by the customers. 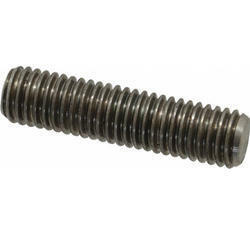 Fully Threaded Stud offered are made available by us in a range of finish material choices including carbon steel, stainless steel and others like titanium, brass as per the specific requirements of the applications. Made available in fully threaded construction finish, these studs are provided by us with suitable coating support involving use of hot dipped galvanized plating as well as other specialty coatings that assures of their lasting performance. Some of its features include meeting tight tolerances, suitable for varied applications like as join parts, permanent fixtures, available in range of sizes and lengths, choice of tap end/ double end configuration and others. 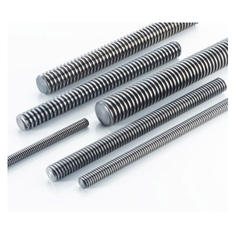 Threaded Bars offered feature precision construction and fabrication finish and comprise long studs/rods that are available in superior threaded finish on both ends. These bars are developed using superior heat treated and high strength alloy which makes these lasting in usage as well as meet the desired strength and toughness properties. Some of its features include uniform grain refinement, better resistance to creep and fatigue failure, smooth hardened threads, superior grain structure support, excellent surface finish and others.